I am responding to an article in the July/August issue of Vintage Airplane regarding Youth Aviation Programs. I am a member of EAA Chapter 1083 in Salisbury, NC. We began a summer day camp, ASCEND- Aviation Summer Camp: Exploring New Dimensions in 2011. In 2017 we completed our 7th successful year. We hold one session for a week during the summer from 9-3 each day at the Rowan County Airport and on Saturday we host a Young Eagles rally, open to the public, but where each student from camp receives a right seat flight. We have been extremely successful with our camp and promoting aviation. We have, as best I can estimate, about 30% of the campers who have continued to explore aviation in some way or another. 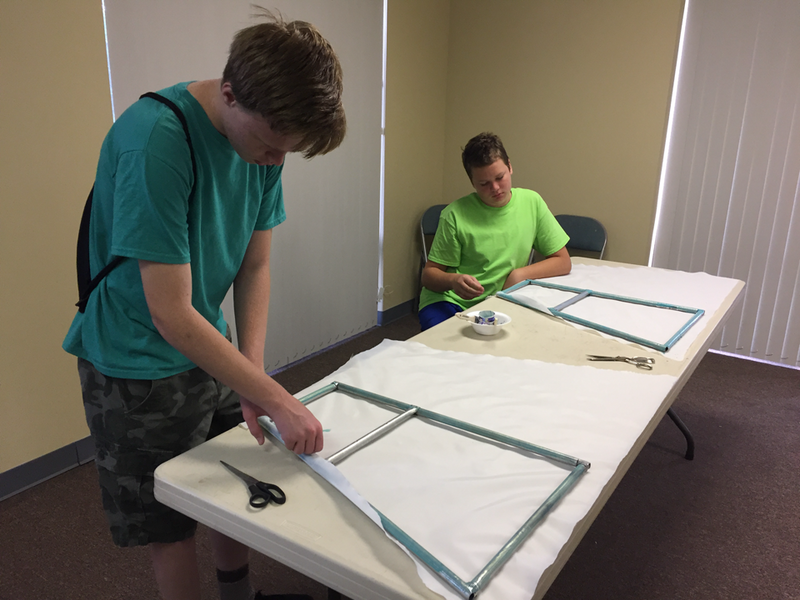 We give students an overview of aviation which includes the aviation alphabet, some of the history, the parts of the airplane, forces of flight, weather, flight planning, traffic patterns, instruments, flight simulator, and in addition we conduct sessions on fabric covering and riveting. All of our instructors are volunteers from Chapter 1083. Two of our members are teachers and they organize the students according to age – (our age requirement is 13-18)- into three groups. For instance, Monday consists of an introduction and we then break students into three groups – one group is instructed in the History of aviation, group two is instructed in the parts of an airplane – using an airplane – to show the parts, and the third group is instructed in the aviation alphabet. All groups are hands on in order to engage students and encourage participation. Each day is structured in a similar manner. We have two snack breaks and a lunch break. We provide all food from local restaurants. 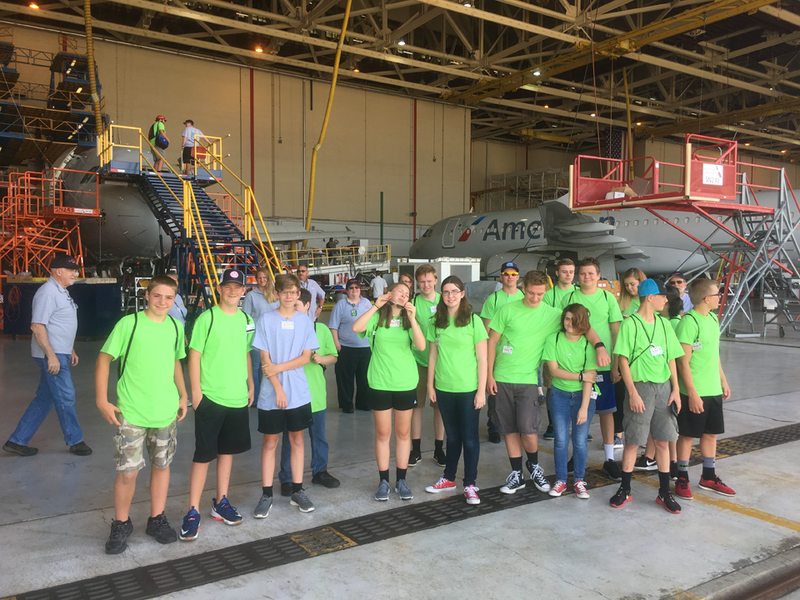 We also take a field trip during one of the days and rent a charter bus to transport students, Our field trips have included a trip to the Charlotte Aviation Museum where the Miracle on the Hudson resides, as well as to a maintenance tour of the American Airlines facility. 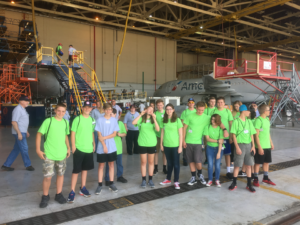 We have also been to PTI Airport, HEICO Maintenance facility, and a local college that has an aviation program in conjunction with Embry Riddle. 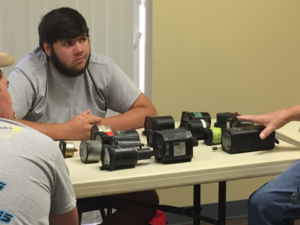 Our camps have anywhere from 12-20 students and we charge a tuition of $150. We give them three T-shirts with our logo and a cinchsak. We also give them a certificate at the end of the week for a discovery flight worth $125. This flight is something they have to initiate with a certified instructor and expires the end of the year they attend camp. We have posted several videos of our camps and they are accessed through YouTube. 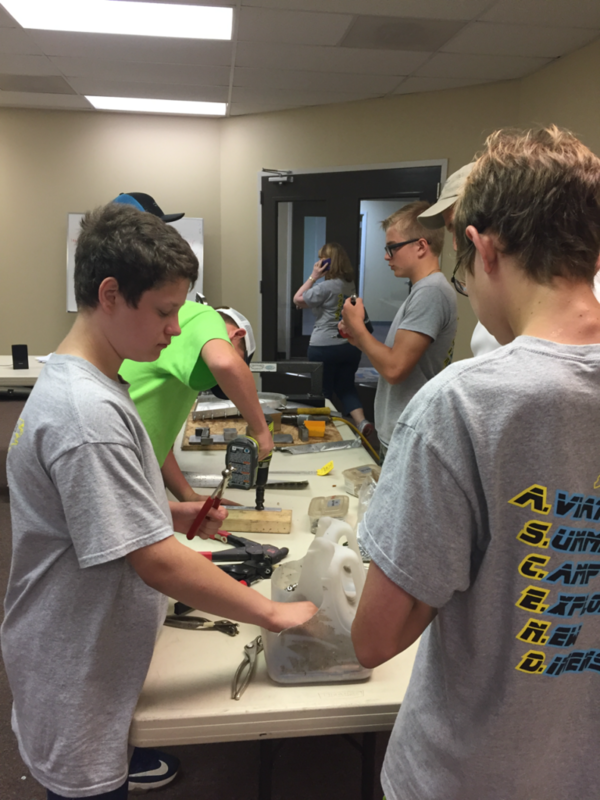 Just search for ASCEND: Aviation Summer Camp Exploring New Dimensions in Salisbury, NC. While we run a day camp and cannot house out of town students, we would be happy to share our ideas and curriculum with other interested groups. “I am truly blessed to be an ASCEND graduate from 2013, and then come back as a camp counselor. When I attended ASCEND, I learned more than just the basics. I learned how to rivet a wing, how to cover a wing with fabric, and also I learned all the steam gauges. Another thing I learned is no matter what part of aviation you like. We all have that same love which makes you a family, even though everybody’s background is different. Also being a student everyday was electrifying and all of the instructors made aviation interesting and came with immense drive to teach all the students about aviation. Hopefully this helped everybody find a piece of aviation that gives you that spark where you just think about aviation everyday from that day on. “ASCEND is a well-rounded, accessible, and affordable summer day camp for young aviation and STEM enthusiasts. The programs are diverse and teen-friendly. The camp is run by two amazing ladies, Jana and Tammy, who are both elementary school teachers and married to pilots/ASCEND Staff members. So, they understand how to get and keep the students engaged in learning. All of the ASCEND Staff are completely volunteer and wear many hats throughout the week. 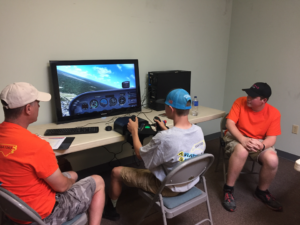 They do a combination of activities ranging from set-up/tear down/clean-up, curriculum planning and teaching sessions, helping with the logistics of running the camp, piloting our Saturday Young Eagle flights, and dozens of the other intricate details to make ASCEND run as smoothly as it does. It’s like a well-oiled machine going into the seventh year. I was a Camper in 2012 and came back as a Counselor for several years following, eventually leading my fellow Counselors. I live over an hour’s drive one way from the camp’s location, and my situation isn’t uncommon. We have Staff and Campers regularly come as far, if not farther than, I do because ASCEND is such a unique program. All of the Staff have become family to me. I cannot speak highly enough of ASCEND. 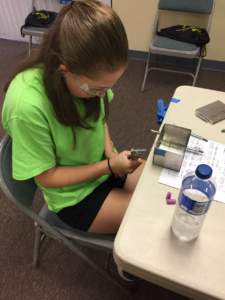 This camp is a leader in aviation summer camps. Saturday is my favorite day because every camper has a huge smile on their face after they graduate, complete their flight, and take the annual group picture with their new friends. ASCEND truly changed my life. It was the catalyst to realizing my aviation dreams. I have now graduated from college with an Associate’s degree in Aviation Management and am pursuing my Bachelor’s and Masters degrees online through Embry-Riddle Aeronautical University while working as a young professional in the aviation industry. 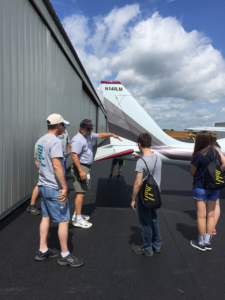 I have also helped found a nonprofit organization dedicated to promoting youth-based, aviation educational programs just like ASCEND called the Youth Aviation Programs Association (YAPA). ASCEND and the mentors I have gained from it are the reason aviation is my true passion. They drive me to give back to our aviation community and positively influence all budding aviation enthusiasts.